September 26 and 27th marked the 25th annual Mum Festival in Barberton. This year's festival had over 20,000 mum plants arranged in artful designs, amounting to over one million mum blossoms. There are vendors throughout Lake Anna park selling various wares as well as food vendors. Events are held throughout the day on Lake Anna including a show from the Chippewa Lake Water Ski Team. We arrived just as the Mum Festival was starting, so we missed out on the events, but based on pictures I've seen from the Mum Festival Facebook page, we will be timing our visit around the Water Ski Team's event next year. Although there was a free shuttle from Barberton Middle School to and from the event, we parked at Barberton Middle School and walked the half mile to the festival. It was a beautiful day last Sunday and Dave insisted that a walk would be more enjoyable. The event is held yearly at Lake Anna Park. The mums were gorgeous. Immediately upon entering the park we were greeted by sprawling patterns of mums. The sight was breathtaking, the different colors planted into concise patterns was beautiful. O.C. Barber the founder of Barberton was getting in on the fun near the mum sale. We don't have a lawn, but in the future, I'd like to purchase some mums and plant them. There was still a pretty decent variety of colors on Sunday morning, but by the end of the day the selection was quite sparse according to Facebook posts. If you'd like to purchase mums at the Mum Fest, make sure to go early. The mum arch in the center of the landscaping made for pretty photo ops, we played photographer for two women in exchange for them taking our photo. The rest of our stay at the festival there were people taking photos under the arch. The Mum Festival itself is a great place to take photos, there were a lot of parents with children taking family photos and sibling photos. The littlest children were especially cute with the mums, because they're a lot closer to the mums then we are. I watched one little boy run from plant to plant trying to smell each plant. Another popular photo location was the B spelled out in mums. It was difficult to get a photo of, but mums near the "B" spelled out that it was the 25th anniversary. Lucky for me, Dave is pretty tall and was able to get a picture of the burgundy mums among the white mums. The festival extended all the way around Lake Anna, after basking in the blooms and attempting to get a photo of a monarch butterfly on the mums (there were many butterflies, but I didn't succeed in my photo attempts). After weaving through some food and craft vendors we ended up on the other side of Lake Anna where the sand sculpture was located. The shade of the tree wasn't forgiving when it came to lighting, but it was cool to see a sand sculpture decorated with mums, normally they're stand alone art pieces. There were additional vendors past the sand sculpture, including the University of Akron's Hospitality Management students working on food sculptures, their creations were pretty neat. We ended our visit walking along Lake Anna back to the start of the Mum Festival. Our trip around the lake ended back at the beginning where a chalk artist was finishing up his mum design. 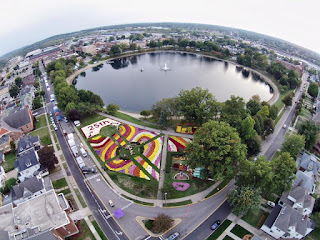 I don't have the capabilities to take an aerial shot of the Mum Fest, but someone did! This photo shows an aerial view of the Mum Fest landscaping taken by Buckeye Drone. To see more aerial views of the Mum Fest and to see a video of the aerial view, check out the Buckeye Drone Facebook page.